It’s hard to sit myself down and type on the lappy when the sun is shining, the birds are chirping, and the breeze is blowing. I put in some window screens, turned off the heat, and opened the windows. Gnocchi the cat is loving it as much as I am! BUT, I made a promise to myself that I would post every Monday, and so here I am. I recently rediscovered Chinese food. This ethnic gem was the food of choice during high school and college, but we just hadn’t found a new Chinese restaurant in our new hometown. I had a craving for lo mein after watching “Catch Me If You Can” at the gym and seeing Tom Hanks’ character eat takeout on Christmas Eve as he chased Leo. Fortunately the husband isn’t too hard to convince to go out, so the craving was fulfilled. I then immediately wanted to make my own with my own enhancements. Naturally I started with a Google search and found a couple of inspiration recipes. I wound up adapting this recipe for the ingredients I wanted to use. I went with this one because it seemed the most authentic. It didn’t call for spaghetti, which is obviously not very Chinese. And it called for two things I had never used before–oyster sauce and Siracha sauce. That just sounded exciting! I realize that because of the oyster sauce, this is not completely meatless. Meh. (Hence the 98% in the title). I’m a pescatarian, so I’m not concerned about a seafood product. If you’re a real vegetarian (or vegan) feel free to experiment with your favorite teriyaki sauce instead. I also couldn’t handle the thought of buying another new type of noodle. I had some egg noodles left over from when I bought some for my Mushroom Bourguignon, so I decided to use those. I was more concerned about the flavor of the noodle being more accurate than the shape. Therefore, spiral egg noodles > wheat spaghetti. 1. Drain and press the tofu. Mix together the first three ingredients to create a marinade. 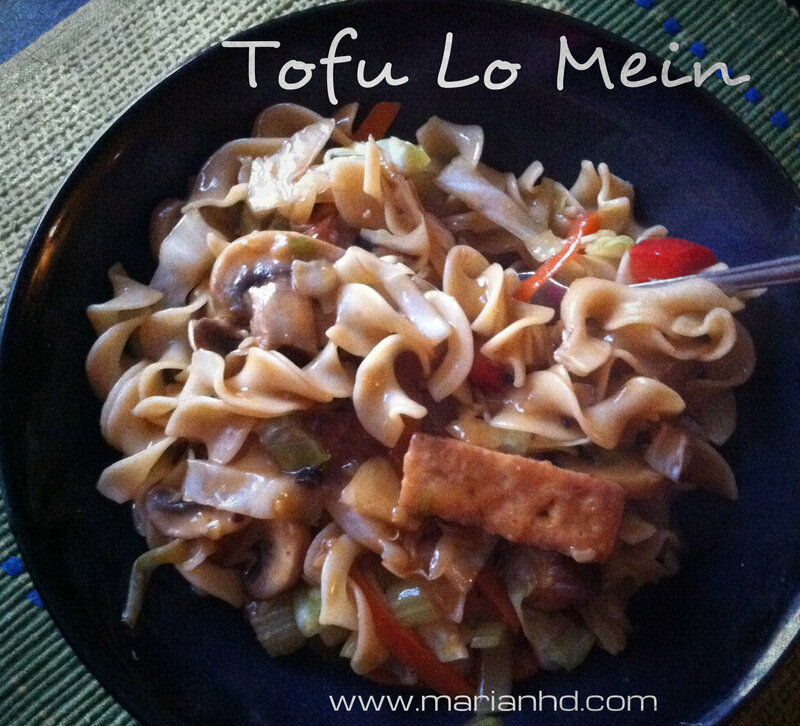 Cut the tofu into the size of your choice, and place in a shallow dish just big enough to fit them all. Drizzle all of the marinade over the tofu and let it marinate for at least 15 minutes. For maximum absorption, flip the tofu at least once. 2. 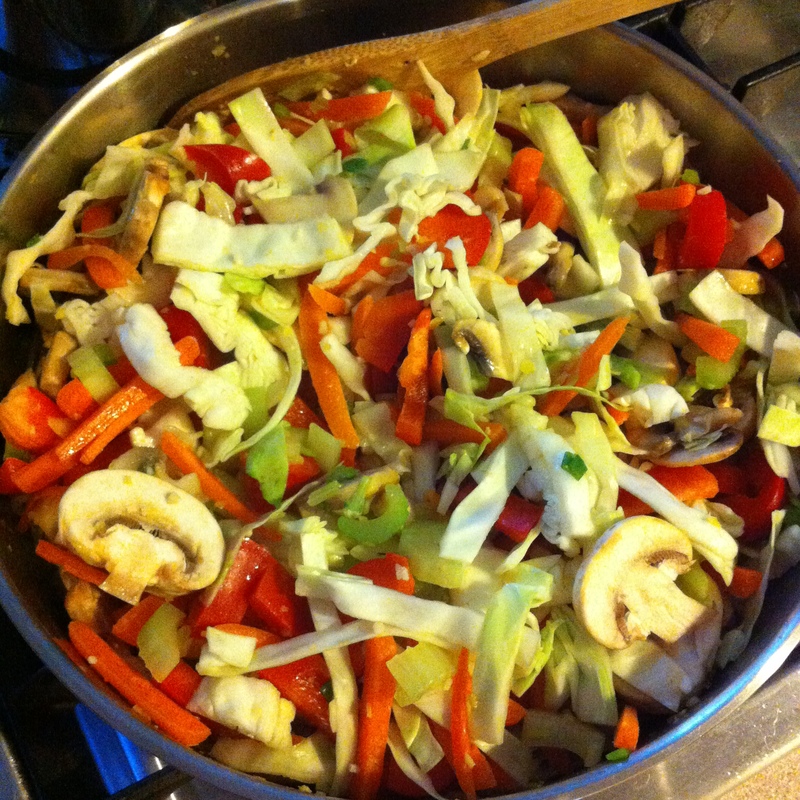 Heat a wok or large skillet over medium-high heat and add 1 tbsp vegetable oil. Once hot, add the tofu and half of the garlic, half the ginger, and half the green onions. 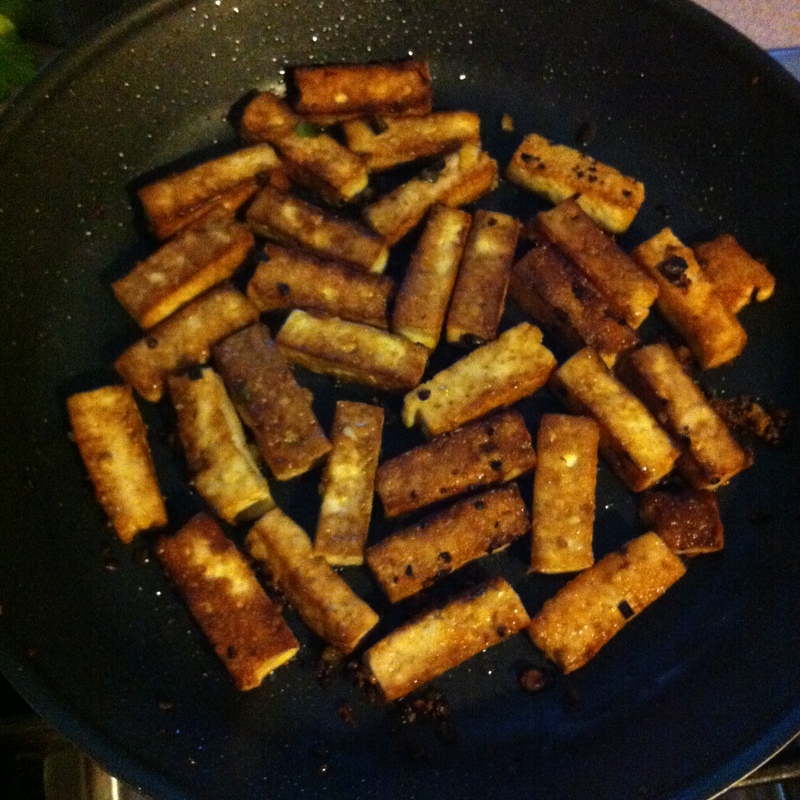 Keep turning the tofu to get all of the sides crisp and brown. Bring a pot of salted water to a boil to cook the noodles while everything else cooks. 3. While the tofu is cooking, combine the vegetable broth, oyster sauce, soy sauce, sesame oil, and Siracha in a medium bowl. Trust me, it’s not too much sauce. 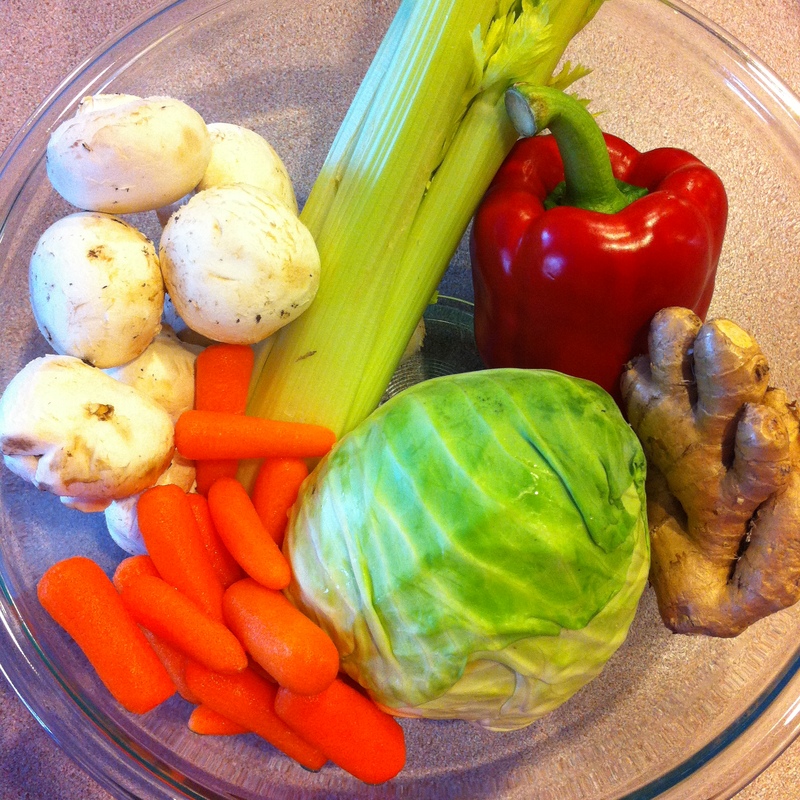 In between tofu turns, take time to chop all your veggies–mushrooms, celery, carrots, red pepper, and cabbage. 4. 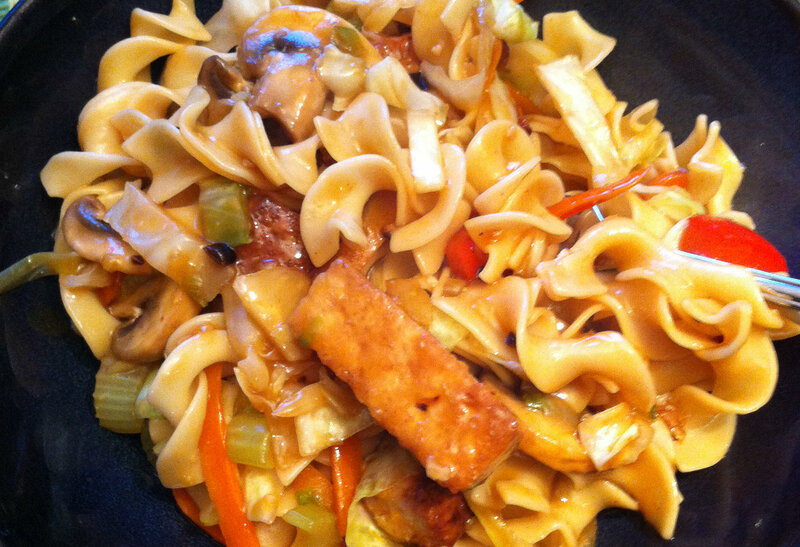 Once the tofu is finished, transfer it to a separate dish. Heat the remaining vegetable oil in the same skillet or wok. Add the remaining garlic, ginger, and green onions and all of the veggies. (I actually had to split mine into two skillets!) Saute everything for about 5 minutes, or until the veggies begin to brown and caramelize. When the noodles are finished, drain and set aside. 5. While the veggies are cooking, whisk the cornstarch into 2 tbsp of cold water and then add to the sauce mixture. 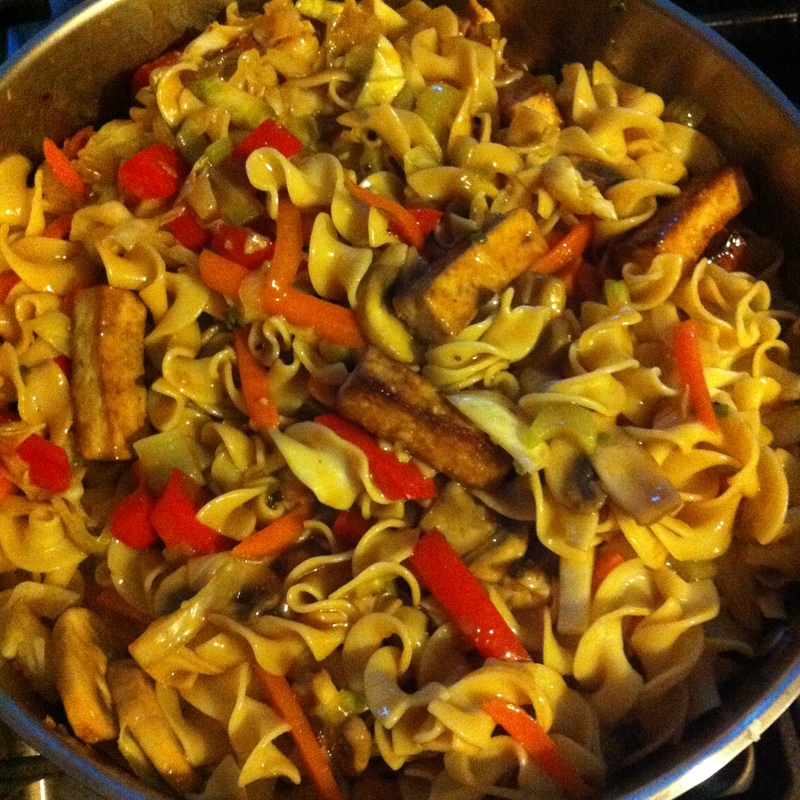 Add the sauce to the veggies and bring to a simmer, then add the noodles and tofu, and serve!